For the final day of bookmarked dishes, I decided to record a dish that was liked a lot and cooked couple of times. Yet we didn’t remember what all went in, even though its the simplest recipe. When Amma asked again on the details, I thought I should record it for later use. So excuse the barely there picture. I was without my gears and clicked with whatever was handy. Even for the first time, this simple stir saute will lend itself. Amma said it was very tasty with rotis, this time we tried as a side for the rice too. I ate it more as a salad before beginning the meal. So choice is all yours! With this we winding up the BM#58 Edition. I am all so excited for the December to happen. What with Bakeathon etc to happen, though not even one post is ready! Lets see how things go on! Wash and clean the broccoli, soak in hot water for 5 mins. Then bring it to boil in enough water for 5 mins. Drian and keep it aside. In a pan, heat oil and saute onions and garlic, then add the carrot pieces. Sprinkle water and cover with lid. Next add the drained broccoli and crushed fennel seeds powder, pepper powder. Stir well and cover with lid. Cook in simmer for 10 mins and remove. Sprinkle lemon juice after removing from flame. That is one healthy dish, Valli. I would love to have it like a salad. No fuss recipe. My favourite combination in stir fry, love it simply with some rice or rotis. 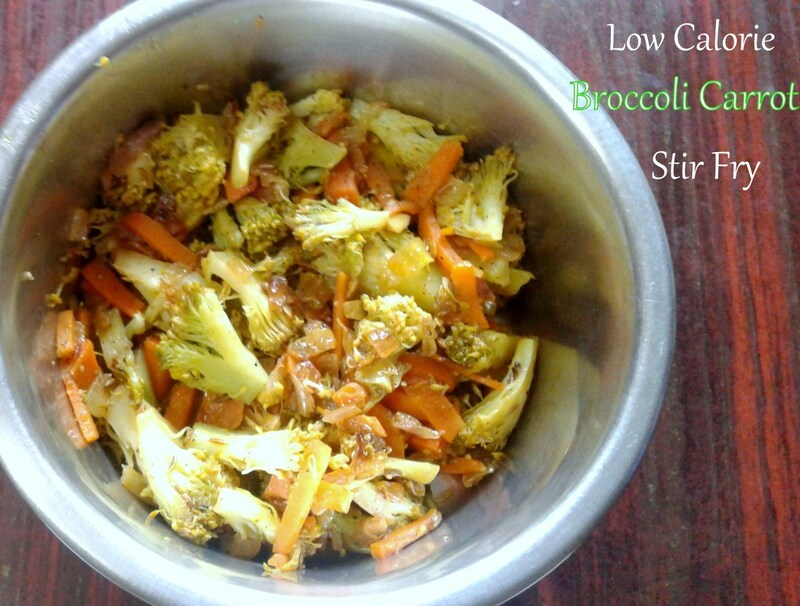 Lovely combo of broccoli and carrot…simple and tasty! That is such a healthy & delicious broccoli curry.